Ratan Tata claims he was inspired to think of the one-lakh-rupee car when he saw a young family trying to brave the rains on a scooter. 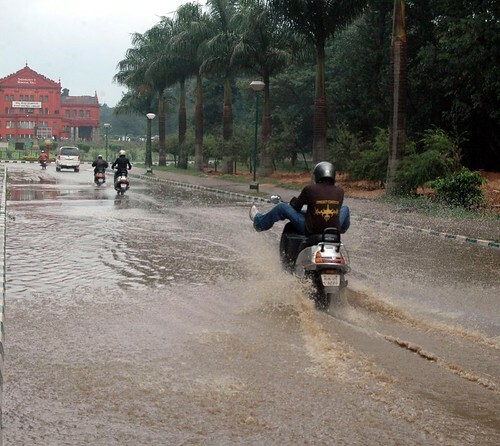 But can even a one-crore-rupee car come close to the thrills of riding a two-wheeler with both feet in the air, after a rain in Cubbon Park? This entry was posted in Life Etcetera, Mysore-Bangalore and tagged Churumuri, Cubbon Park, Karnataka Photo News, KPN, Nano, Photography, Ratan Tata, Sans Serif, Tata Motors. Bookmark the permalink. ← CHURUMURI POLL: Proof of Hindu terrorism? No. It won’t. That’s why every car owner should keep a two wheeler (preferebly a scooter) too..
Will the car really cost just one lakh excluding all taxes? After reading the last sentence, I remembered a Kannada movie of Srinath and Ashok, whose name I have forgotten. Indeed most of us have done this circus at one time or another on Bangalore’s undulating roads, during rainy seasons. But, this guy was lucky enough to be caught by your camera! The comments are true for a strapping youth of 20. But, Ratan Tata is talking about a small car for a small family. That scooter ride in the rain could be disastrous for such a family.. However the picture is wonderful; full marks to the photographer. Any genuine Kannadiga can only wish we all really speak (email) your feelings….. This trill belongs to a generation. It has to be preserved (probaly by photos like this). The new generation deserves to enjoy such thrilling experiences safely. How about Nano with the option of an Open Top?!!!! !